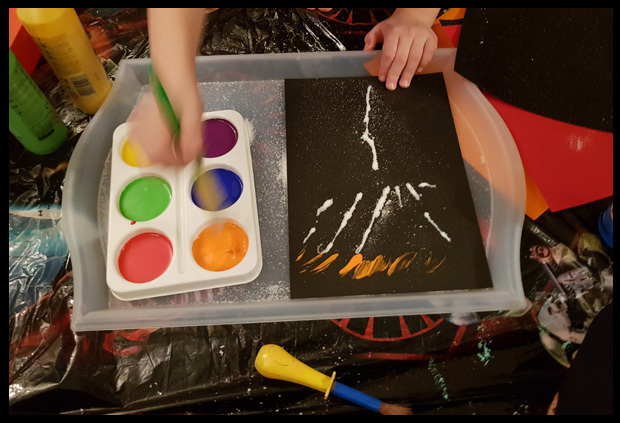 As we reach the end of the year, The Bostik Blogger challenge for the month was to create New Year crafts, so we chose fireworks and we got messy! 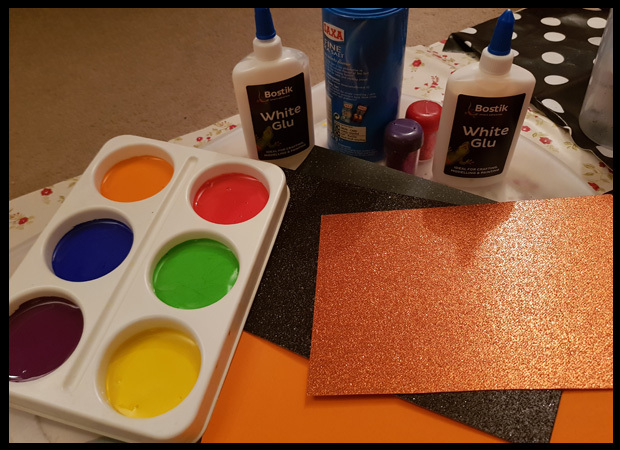 Sometimes we'll get the paints out, sometimes we'll get the glitter and glue out but very very rarely we got all 3 out!! And whilst I slightly cringed putting my PVC tablecloths all over the floor, my child stripped off and tried to wait for me to get all the prep work done! The PVC cloths are from the Range and cost me £1! They often have a clearance shelf in their fabric section and I highly recommend picking up a couple if you see them. These are ideal for messy play! 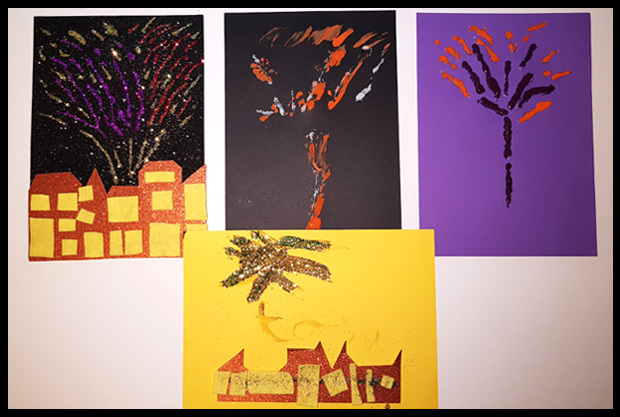 We chose dark cards for the night sky and drew out the shape of fireworks in glue. Salt Painting: Something we have never created before, so this was very much trial and error. After drawing out the fireworks in glue we covered the image in salt. The excess salt is shaken off and then covered with water paints. The fireworks end up standing out on the page, and look rather good! I strongly suggest creating these in a tray, on the sheets, with your child in old clothing (or none if you're my child)! Glitter Fireworks: For me, this was a lot calmer. I know how that sounds - glitter and calmer do not tend to be in the same sentence, so that gives you an idea of how much fun my son had with the salt!! This works in exactly the same way as the salt. 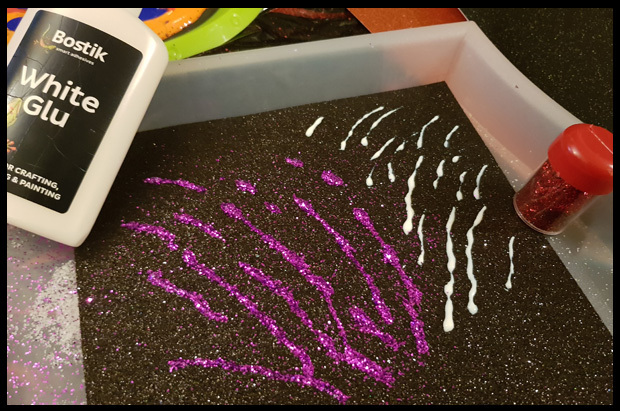 We drew out a section of the fireworks with Bostik glue and covered this with red glitter, once the excess was shaken off, we drew more glue on the card and covered with purple glitter and repeated the process again for the yellow glitter. A great quick and easy craft that the kids will absolutely love. I haven't heard of salt painting either. Looks like Max had fun doing these. Did it confuse him doing New Year craft before we even get to Christmas or did he just think it was late fireworks? I don't think he thought that deeply Claire, he just heard paint and off with the clothes!